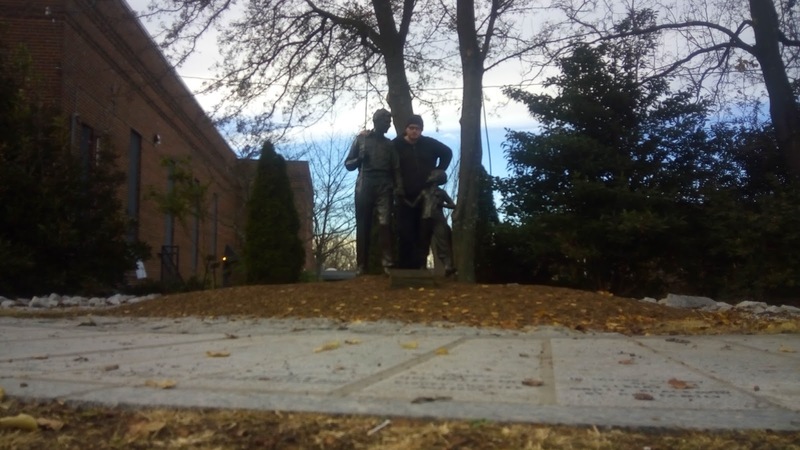 So on my trip down south to escape the freezing cold and snow that was right at my back, I took a little detour into the past. 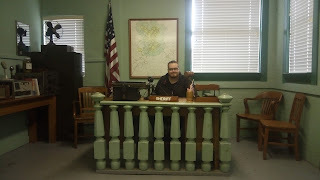 I decided to go to Mayberry, home of lovable characters Andy Griffith and Barney Fife. 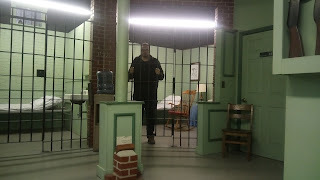 Well, in reality I visited where the show was filmed, in Mt., Airy North Carolina. 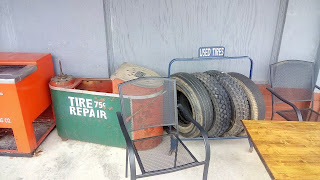 I wasn't quite sure what to expect or how exactly to find what I was looking for. 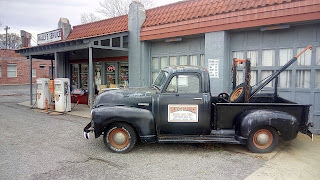 I asked a local guy at autozone where the Andy Griffith museum was, and he gave me directions. I actually missed it though, and headed into the small towns downtown district. 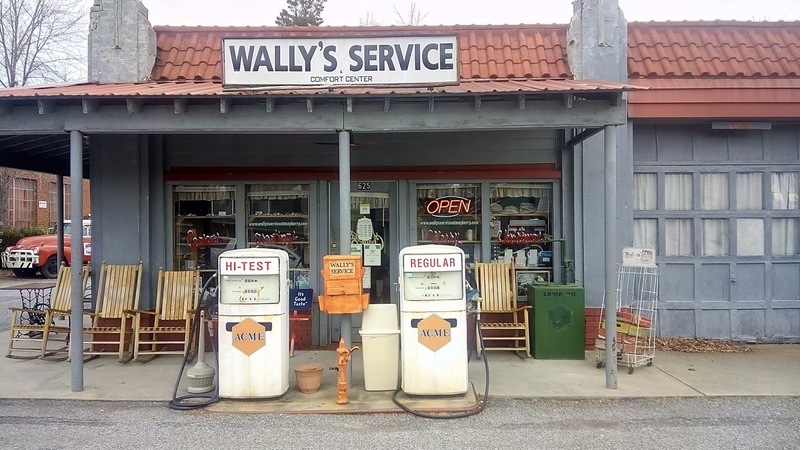 A couple of wrong misguided (aka i was lost) turns later and on a completely regular unassuming suburb street I found it, the real Andy Griffith museum, the Mayberry Courthouse and Wally's Service Station. Surprised I awkwardly steered a hard left into the small driveway, not really sure where I should park. Apparently, according to the hotel/gift shop manager, anywhere is just fine. I also found out from her that the courthouse/jail/sheriff's office should be open and if free to enjoy and take pictures. Awesome! So I did just that. Outside there are names of all the characters laid into the ground. Walking through the door was a blast from the past. Everything was there from the shows. The rifles on the walls were clearly props, but the old phones, the radio equipment, furniture, everything looked just the same. I'm assuming like most tv and movie sets, it is a bit smaller than you would expect, but it still managed to get 2 jail cells and the sheriff's area in there. Another nice surprise is that the cell doors are open, so you can even go inside for great photo ops. I love the fact that otis had the key ring on the wall next to his cell, and he could just let himself out when he sobered up the next morning. And its still that way! I wonder if someone staged this place after the show was over, or they just left it exactly the way it was? Probably the only difference I noticed was an old old TV set in one of the cells, I dont remember that from the show but it didnt seem out of place. 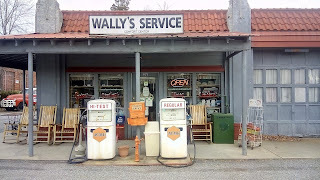 After I had my fun playing both Andy and Otis, I went out side to see the service station. 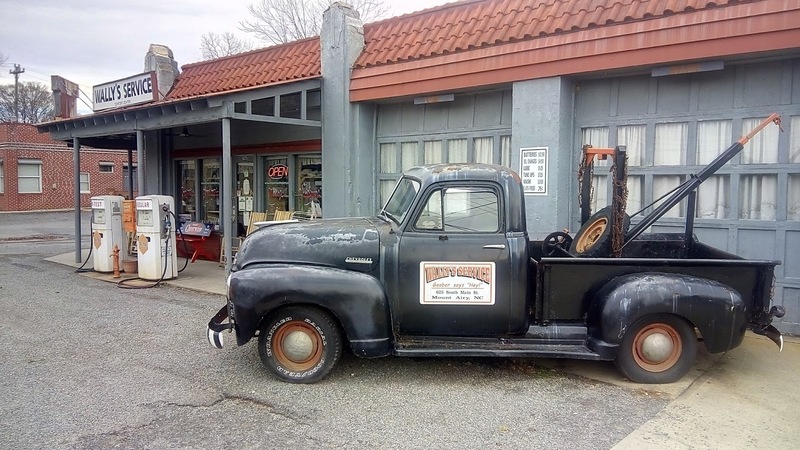 Complete with old trucks and a bunch of antique auto equipment and pumps, you'd almost think the place was still open in the same condition. Unfortunately it wasn't though, so I made due with outside pictures. I was a big fan of the Andy Griffith show growing up. I only got a handful of channels on our old tv, but I loved watching this show and the wholesome slice of Mayberry's daily life. The town of Mt. Airy isn't too bad either. I found a nice community park with great free facilities right near by that I hit up for lunch. It has a nice trail and fishing there, as well as some geocaching. Although you can't stay past dark, the town had a convenient overnight spot in the local Cracker Barrel. Big lot, friendly manager when I asked, perfect. On the way to the cracker barrel i saw out of the corner of my eye a modern looking building...what do you know, the official Andy Griffith Museum. I pulled over but as I thought about it, I think I already visited the real deal down the road, who needs red ropes and display cases? So I just snagged a quick picture with Americas most famous Father & Son fishing team. If you'd like to view the courthouse through some vicarious tourism, here is a video of me checking things out. Thankfully not quite as silently as my New River video lol Forgive any giggling like an excited school girl.